Continuing on with cyanotypes I have been adjusting the negative over the last few days. Incidentally, this photo was taken on a Bronica ETRSI using Ilford fp4+ film developed in Paranol S and printed on Ilford classic fibre based paper. To produce the negative for cyanotype the print was scanned into the mac via my Epson V600 300DPI, rescaled and saved as a Tiff. General adjustments to levels and brightness were then made in Photoshop CC followed by bringing in both ends of the contrast levels before it was flipped and inverted via an adjustment layer to reveal the negative. A new fill layer followed adjusted to make a UV blocker of amber colour. A new curves layer was then added increasing the contrast for this particular image until I felt it was correct. This part needs to be done for each image individually. the negative was then printed on my Epson R3000 onto Agfa copyjet film sheet at A4 size. As can be seen here the highlights are not correct so a further negative was made with adjustments. The darkness to the right lower corner is more to do with shadow over the photo taken on my iphone than the image itself as the print was still drying on my racks at the time it was taken. This second cyanotype was a 170-second exposure and was toned in green tea for 25minutes after a wash, bleach, wash cycle. This seems to be nearer in terms of highlights, especially where water is involved and the toning is a quite pleasing colour. The settings used here in the curves layer has been saved and will be used as the bases for adjustments in future cyano prints involving water. I have also saved info on the various papers I have used during these prints so I now have an exposure chart for the papers. This week I have been taking another look at cyanotypes as I haven’t made a cyano for a while, and having a few shots that I thought would make a nice print followed by some toning, I set about making a print or two. Above is one I made some years back and although I was reasonably happy I still thought the highlights lacked a little in tonality. The method I have used in the past is to use a darkroom print which is scanned into the computer adjusted to greyscale and saved as a PSD. Next, adjust the levels at both ends bringing them both in towards the centre around 10% and reducing the contrast in the mid tones until the whole photo is balanced. This is followed by reducing the contrast again down to zero once or twice, to combat the extreme contrast of the cyanotype. The image is then flipped and inverted to a negative. To produce the negative I use an Epson R3000 which has extra blacks ( good for digital Monochrome prints) and using a printer profile of Epson glossy, photo black ink not matt, I print out the neg on Agfa copyjet acetate which is available from “Positivity ltd” (they are on the net), “Permajet” also do transparency which they call digital transfer film. In order to increase the tonality of the highlights, I am now working with using a negative which uses an orange fill layer designed to reduce the UV and hopefully bring some tonality into the highlights. This will require some experimentation using curves so more posts on this in a few days time, but for now here is the first using the orange layer which I will be printing. Another way to keep vauable information built up over years is to keep a sketchbook. I use a ringbound artists sketchbook by Seawhite. The paper is good quality and a good thickness to which I regularly add photos, drawings, comments and full detail of sessions. Studio session notes with lighting or flash diagrams are of great use to record and look back over before setting up for a future session. like wise for darkroom sessions where you can keep notes of settings for different enlarger heights when moving from one paper size to the next with the exposure compensation record. A narrative of work for a project is another good use of the sketchbook. Over time many famous and not so famous photographers have kept sketchbooks, infact there is a book on the subject… Photographers’ Sketchbooks by S. McLaren & B. Formhals, 2014 Thames & Hudson. In addition to recording general developing and printing data in an A4 note book I find that recording dodge and burn information is best done using a working print where I can sketch around the area then add times as minus or plus seconds. This info can then be the basis of any reprints at a later date. Here is one I was working on the other day where you can clearly see the effect of burning in the sky for an extra 27 secs from the working print to the 2nd print. 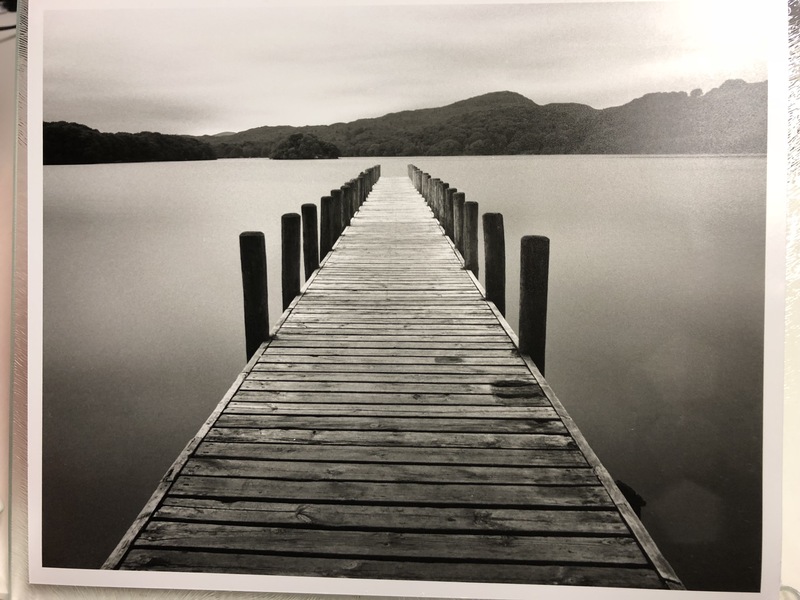 In this case the surning in at the end of the jetty was not enough so a third print was made. but when I viewed them together I quite liked the bright area in contrast to the rest of the print. Recording such information like this provides an easy visual reference. I use a traditional glass pencil (good art shops will have these as they are used to draw on ceramics etc) but having said that I guess a marker could be used. I have been using one of these profiling tools instead of cutting a profile of the foreground every time I need to burn in a sky. Quick and easy to use… I just thought one day ‘what could I use for this job that could be re-useable’. You can see here the how shadow area can be manipulated to follow the outline of the foreground against the sky. Forming the shape is done by projecting the negative in the enlarger at a height that is comfortable and following the area to be masked off with the tool fingers. By raising and lowering with slight side to side movement during the burning exposure the sky is burned in without leaving an obviuos border. Yesterday’s darkroom session revealed a couple of decent prints. I use Rc papers for my initial assessment of prints where any that I think are worth further work are then printed using Fb papers and a change in developer. The film is Ilford fp4+ and was rated as standard 125 iso. These were taken with medium format film on my trusty Bronica ETRSI. As I wanted to create a smooth soft feel to some of the prints I used my Hitech ten stop filter hand held in front of the Bronica which was mounted on a tripod whilst timing the exposure on the iphone. I have cropped portrait, which is a departure from the usual landscape but I think it works here with a central view as opposed to applying the rule of thirds. By the way the print wiper shown here is and excellent way to remove excess water from your prints without pulling at the paper as the scissor type wipers do. This is generally used to remove water from cars etc. with the print supported on the glass I just pull down then across. The profiled blade gathers the water then off of the galss onto a cloth to absorb the excess. The prints can then be dried on screens FB papers or hung to dry if RC. This is my day job. Schools and teams photographer covering the South West UK and beyond. I have an extensive library of books built up over the years covering both film and digital which I add to year on year, some old (like 1920s) some new. A lot of the older info is relevant even today so well worth investigating. I thought it might be a good idea to list a few here for those who are new to film and those not so new. All about Photography by Percy Salmon. My edition is 1924. Ward Lock & co. Developing by C. I. Jacobson. 1940- My edition is 1944. focal press. Enlarging by C. I. Jacobson. 1940- My editions are 1944 & 1967. focal press. Ilford Manual of Photography. Many editions. I have 1958. Percy Lund, Humphries. Photography Theory and Practice by LP Clerc. 1930 on. Mine is 1971 with R. E. Jacobson revisions. focal press. The British journal of Photography Almanac. I have the 1955 & 1957 editions and this was the 98th year of printing. Greenwood. Camera Movements by George Wakefield. 1955. Fountain press. 1 The Camera by Ansel Adams. Many printings and I think still in print. Little Brown. 2 The Negative by Ansel Adams. As above. 3 The print by Ansel Adams. As above. Zone System by John P. Schaefer. 1990. Morgan. Larry Bartlett’s Black & white printing workshop. 1996. Fountain press. Exploring Black and white Photography. 1993. Arnold Gassa A. J. Meek. WCB. John Garrett’s Black & White Photography Masterclass. 2000. Collins Brown. Elements of Black & White printing by Carson Graves. 2001. focal press. The Photographers Master Printing Course by Tim Rudman. 1994. Mitchell Beazley. John Blakemore’s Black and white photography workshop. 2005. David & Charles. Way Beyond Monochrome by Ralph Lambrecht & Chris Woodhouse. 2011. focal press. The Art of Photography by Bruce Barnbaum. 1994. rocky nook. The Essence of Photography by Bruce Barnbaum. 2015. rocky nook. Advanced processing and printing by Adrain Ensor. 2001. Rotovision. Ilford Monochrome Darkroom Practice by Jack Coote. 1988. focal press. Photographic Chemistry by George Eaton. 1986. Morgan & Morgan. The Darkroom Cookbook by Steve Anchell. 2016. focal press. A few here on Lith printing and alternative process. Beyond Monochrome by Tony Worobiec and Ray Spence. 1999. Fountain Press. The Master Photographer’s Lith Printing Course by Tim Rudman. 1998. Argentum. The world of Lith Printing by Tim Rudman. 2006. Argentum. Alternative Photographic Processes by Christofer James. 2009. Delmar. Experimental Photography by various authors. 2015. Thames & Hudson. Photographer’s Sketchbooks by Stephen McLaren. 2014. Thames Hudson. The Art of Photography by Ted Forbes, episodes on youtube covering all things photographic. There is a link in Resources at the bottom of this blog. Well worth visiting. Clic back to the early episodes for loads on B&W film. On entering the darkroom Friday, which was very cold as we had snow here on Thursday, I discovered a lack of water supply. Further investigation leads me to the water filter, which is mounted on the wall outside the building. Despite it being in an insulated box the freeze up managed to blow the top off the filter destroying it in the process. New filter fitted on Monday with attention to the insulation and the darkroom is back up and running. You can find a darkroom near you. Some offer darkroom hire, tuition (like myself) and use. I am now registered with the Ilford Local Darkroom site offering film and darkroom tuition. Darkroom build & fit out. Photo Mounting & Framing service.